Blackjack Clay has a long standing reputation for producing natural clay of the highest quality. Our traditional SS2 clay is a combination of several different clay types. These various clays are mined directly from the earth here in East Texas. This extraordinary clay is never dried out or processed into a powder form. The natural character and potential remain locked in, allowing the clay to maintain its inherent pliable properties. The term often used to describe this flexible quality is plasticity. The body that this clay possesses makes it perfect for hand building. SS2 does not have a tendency to sag and lends itself readily to projects requiring vertical side strength. It bonds to itself without difficulty and adapts to coil building. SS2 is an ideal choice as a medium for free form sculpture. The properties inherited from Mother Earth make throwing with this clay an enjoyable experience. SS2 has a remarkable smooth feel and texture. Once the piece is allowed to dry to a leather state, it can be carved and decorated easily. The clay responds well to glazes which can be applied directly to the greenware or added to bisque ware before a second fire. SS2 stores well and retains a pleasant, clean earth smell. It will remain moist as long as it is not exposed to air. If long term storage is required, we offer large filter cake bags. These bags, which hold up to 2000 pounds of clay, are great for double bagging large quantities for long term storage at your facility. Unfired SS2 is close to the color of milk chocolate. Once fired, the clay will become a soft buff or tan color. SS2 can be fired from cone 6 to cone 10. What makes Blackjack Clay different from other ceramic supply businesses selling only pugged clay? Traditional ceramic supply businesses are set up to meet the needs of the individual end user. Their customer base is typically an individual person, be it students, studio potters or anyone with a yen towards pottery. Blackjack Clay evolved symbiotically with the growing stoneware industry in Marshall, Texas. Typically, industrial ceramic producers must process their own clay bodies in order to maintain strict quality control. For these producers consistency is a must. The filter pressing, used by Blackjack, is the time tested universal process. It is essential for refining and mixing the highest quality clay body for the manufacturing of any moist or wet pressed clay. Filter pressing is a costly and labor-intensive process for mixing and refining clay bodies. Processing the clay in this fashion allows all the wonderful natural attributes of the clay to be kept in tact. You will feel the difference the minute you begin to work with our clay. Blackjack offers this quality clay in both filter press and pugged form to both large and small end users. Blackjack Clay Company offers the only "pure Texas" clay bodies. None of the clays used in Blackjack's process are from dried, bagged materials. 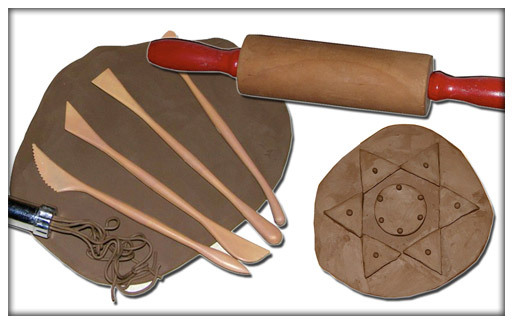 Drying clay changes its ability to react to water thus reducing the clay's natural plasticity and workability. Blackjack uses only non-processed, crude clays for their throwing bodies. All of the clays used are mined within a 20-mile radius of the processing plant. Many of these clay deposits Blackjack owns and mines itself. Most of Blackjack's pits are an acre or less in size and not over 20 foot deep. These deposits are too small to be commercially viable for large operations like Kentucky-Tennessee Clay Company, which mainly serve the ceramic tile industries, but are more than adequate for the pottery industry. With a deep sense of environmental commitment, each mining campaign is planned on a mining and reclamation program. Mining approximately 6 weeks every 2 years, the clay is removed and stockpiled, the pit area is then back-filled with overburden (removed prior to the clay retrieval) and the walls sloped. What remains at the end of each mining campaign are not huge muddy pits or ugly holes in the earth, but enlarged cattle ponds which, with subsequent mining will grow into lake areas increasing the value of the land. Typically, Blackjack has a mining campaign every 2 years. The clay is hauled to the plant and stockpiled outside. Stockpiling allows the clay to "age" or "weather" no less than 6 months before going into production. Weathering of the clay, which are the beneficial effects of wind, rain and sun help both to wash away naturally occurring residual salts and allows the clay to dry (mining moisture of 15 to 18%) so it will break down more easily into smaller chunks. Smaller chunks that will more readily dissolve when blunged into a clay slurry. The clay is brought under roof into the batching area. Each, individual clay has its own storage bin allowing production to run regardless of rainy weather. Each batch consists of 7000 pounds of material. The crude clay is loaded into crushing hoppers mounted above each of the two-blunging tanks, using a Case front-end loader. The clay is carefully weighed using a calibrated gauge connected to the loader's bucket hydraulic system. Sodium feldspar is added to the batch to improve the body's fired fusibility and thermal expansion. Once the batch is fully loaded into the clay blunger, (a large, porcelain-brick lined tank with two large, high speed, low shear agitators) it is allowed to mix (blunge) in excess water for 30 to 40 minutes. During this time the clays are dissolved and any foreign matter (stones, roots, etc.) are released from the clay. The clay slurry (also called slip) is then double screened into a large holding tank. (This tank holds 5 batches of slurry.) Large contamination, rocks, roots, etc., are removed using the first screen, the slip is then passed through a fine 60-mesh screen, which removes any remaining pebbles or undissolved clay leaving a smooth, creamy liquid. Wet blunging and screening allow Blackjack to remove contamination from the clay material. The same contamination that Blackjack screens off, is ground and bagged with the ground clay bought in the standard 50 pound dried clay bags. This dried clay is then used to make clay bodies and sold by ceramic suppliers to potters. The wet blunging and screening is the defining difference between a clay "processor" and a clay producer. This processing is a difference you can feel! The clay slurry (slip) is sent, via 2-inch pipelines, to one of six filter presses. The filter press consists of a frame and 72 metal "leaves" which contact flush with each other to form a seal at their edges, they are draped with a canvas like cloth that will allow water to pass but not clay. Their concave centers are filled with the clay slurry and using compressed air (120 pounds per square inch) all but 20% of the excess water is squeezed from the slurry. What is formed between the metal leaves is commonly referred to as "filter cakes." These filter cakes are 30 inches in diameter and weigh approximately 48 to 50 pounds a piece. Each filter press yields 2850 pounds of processed clay every 5 hours. Each press is manually opened and emptied of the filter cakes by the production team. The cakes are stacked in a large plastic bag placed on a wooden pallet. Much of Blackjack Clay's production is maintained in filter cake form, destined for their large industrial customers. The pallets of filter cakes are staged in the warehouse on pallet racks in a "first in first out" format. As tractor-trailer trucks pull in, the pallets can be pulled from the racks and loaded quickly onto the waiting truck. Seventeen pallets make up a single truckload, and Blackjack can warehouse up to 7 truckloads at one time. The filter cakes are generally too large and cumbersome for the individual potter to process. For these customers, Blackjack Clay processes the filter cakes one step further, and this is called "pugging" the clay. The pugmill consists essentially of knives set as a screw (or auger) on one or two rotating shafts moving in a trough. The filter cakes are fed into the auguring trough. The knives cut and blend the filter cakes as they are pushed into the de-airing chamber. The pugmill is used to improve the uniformity and workability of the clay body, the de-airing process pulls a vacuum removing trapped air bubbles and radically increasing plasticity. The pugmill is designed to perform much the same function as the hand "wedging" process used by potters. Blackjack uses a large industrial International pugmill; this pugmill has a 6' x 1' x 1.5' auger trough and a de-airing chamber of 4' x 1' x 1.5'. This machine was specifically designed for the brick industry. Blackjack provides all the benefits of an industrially processed clay body to each and every customer regardless of size or volume of use!